Tag line: "Identity is a secret. Identity is a mystery. Identity is a killer"
Eleven people are stranded in a remote Nevada motel during a torrential rainstorm. Included among them are Ed (John Cusack), a former L.A. cop turned chauffeur who now works for a fading television star (Rebecca De Mornay), and Paris (Amanda Peet), a prostitute looking to make a fresh start. A policeman named Rhodes (Ray Liotta), who's transporting a dangerous prisoner (Jake Busey), turns up as well, as does the York family; George (John McGinley), Alice (Leila Kenzle) and Timmy (Bret Loehr), who were about to begin their family vacation when tragedy sent them scrambling to the motel. Ginny (Clea Duvall) and Lou (William Lee Scott) are newlyweds who don't seem to like each other very much, and the hotel manager, Larry (John Hawkes), is hiding a dark secret. Soon after this motley crew has been assembled, people begin to die, each murdered in a grisly fashion. Then there's the seemingly separate story of a condemned killer named Malcolm Rivers (Pruitt Taylor Vince). The day before he's to be executed, Rivers' attorneys learn that a key piece of evidence had been withheld from them during the trial, prompting the judge (Holmes Osborne) to call a midnight hearing in his chambers. Supported by the testimony of a psychiatrist named Malick (Alfred Molina), the defense hopes to have the death sentence overturned on the grounds that Rivers is mentally disturbed. They believe their client has no memory of the crimes he's committed, and if they can prove it to the judge's satisfaction, a stay of execution will be issued. Exactly how do these two stories connect? You'll have to find out for yourself. I may have said too much already. I've seen Identity twice now, and a funny thing happened when I watched it the second time. On my initial viewing, I was so wrapped up in the film's mystery, the twists and turns driving its story, that I didn't much notice anything else. Now, logic would dictate a follow-up viewing would be a major let-down, simply because all its secrets will have been revealed. Strangely enough, the opposite is true. Concentrating on the subtle clues director James Mangold scattered throughout the movie, I suddenly realized Identity was just as much an in-depth psychological study into the mind of a serial killer as it was an edgy thriller. 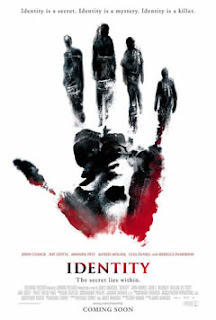 I recommend watching Identity, then watching it again. I'm sure you'll find, as I did, that two entirely distinct, but equally engaging personalities will emerge from this one film. I watched it again not long ago, and expected to be bored and see all the clues to the ending. That was not the case. It held up great to a second viewing (it had been many years, but still). I was pleasantly surprised.